Here you can find many different straight paraffins & parraffin blends. The lower the melting point the softer the paraffin is. The most commonly used paraffin in candle making and other general purposes is the 140 MP straight paraffin. When making candles it is always best to try different temperatures to see what works best for you as there are so many different situations such as glass/mold size, temperature of working enviroment, fragrance/color percentages, etc. 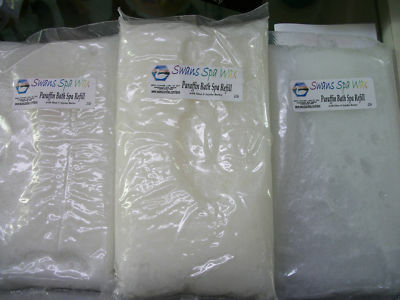 We now carry Emulsifying wax, call for quantity pricing. WE HAVE A FORKLIFT TO LOAD YOUR TRUCK. 140 Pillar Candle Wax 58/60 mottle paraffin wax. For Molded Candles our "General Purpose" wax. Check out our new lower prices same wax, as always we try and keep the LOWEST prices possible. Please call for Pallet pricing and call for shipping quote. NEW LOWER CASE PRICING! This wax works great for fire starters. Pillar and Overdip Wax 150 MP Great for pillars, overdips and for raising melt points. Add an ounce of our PE wax to make this 160 MP paraffin. 159 MP Paraffin for Sand Cast Candles, Hurricanes and Embeds. Calwax CCP1 for containers, tea lights & tarts. Single Pour, nice Glass adhesion, smooth creamy appearance, easy to work with. Comes creamy white, easy to color. 10% Fragrance load, good hot & cold scent throw. Works well when pouring around 170 degrees. CB5 Paraffin Pillar Blend Candle Blend 5 works well with all types of molds - metal, plastic and silicone. This blend has good burning qualities and enables good release for molds. Candle Blend 5 makes colors appear more vibrant and improves surface gloss and hardness. It can be used with heavily scented candles. No additives are required. White Color. Heat wax above 170 for mixing color, add desired fragrance before pouring. Tart Wax, custom blend has excellent fragrance throw and easily removes from tart mold. Very white in color, colors brightly and is a specially formulated blend, specifically designed as a cube wax. It has characteristics that enable it to carry high fragrance loads, not to mention being very economical. This formulation is capable, therefore, of having excellent throw..It is also smooth and creamy which exhibits color well.